The Epson TM-H6000iii delivers high-speed receipt and slip printing, endorsement, two-color graphics and advanced QuickPass check processing all in one compact multifunction printer. For ECC implementation, the TM-H6000iii features the industry's leading MICR reader with over 99.9% accuracy, virtually eliminating misreads and substitution errors. 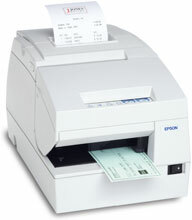 The Epson C31C625A8891 is also known as Epson POS Products	EPS-C31C625A8891	.